Irony runs deep in Minnesota as we wrap up the recent Super Bowl celebrations. On the one hand, the Super Bowl Host Committee (headed by US Bank, EcoLab and many other Fortune 500 companies that run the Minnesota Chamber of Commerce) raised over $50 million to host the 10-day corporate prom surrounding the Super Bowl celebrations. There seemed to be a bottomless pit of money available to show the corporate elite a good time while in town. In fact, they found $800,000 to build an ice palace for the Winter Carnival – the “Ecolab Ice Palace”. And they claim that they were using the Super Bowl to build a legacy for our kids. Now, let’s put our feet on the ground and see what was actually happening in the midst of all of these celebrations. On November 10, 2017, the Minnesota Chamber of Commerce and other business groups filed a suit against Minneapolis over an ordinance that will gradually raise the minimum wage to $15 per hour. Since these companies are all about leaving a legacy for our kids, let’s see what type of legacy this lawsuit would leave for our kids if successful. Currently, the three wealthiest people in the United States own more wealth than the bottom half of the entire American population combined. There are real very real consequences in people’s lives when there is such a stark division of wealth. In fact, according to the Minnesota Department of Health the poorest Minnesotans currently live on average 8 years less than the wealthiest Minnesotans. 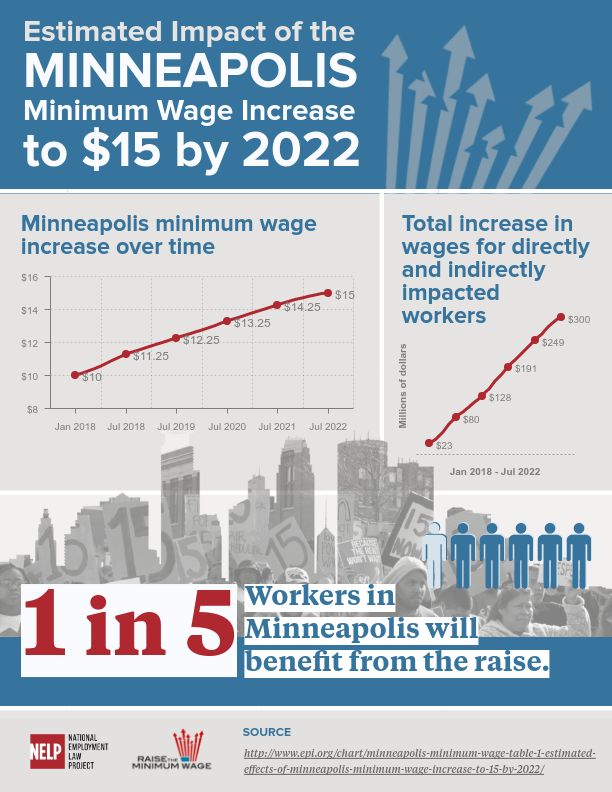 In just the first six months of implementation, the minimum wage increase will bring over $23 million in additional wages into the poorest communities of Minneapolis, coming largely from big business. $300 million will be redistributed back into the community by the end of implementation of the minimum wage, coming in large part from large businesses. In addition, the Minnesota Chamber of Commerce needs to recognize that the minimum wage increase will overwhelmingly support communities of color. In fact, while workers of color make up 32% of the workforce, they make up 53% of the workforce being paid less than $12 an hour. An increase to $15 an hour will positively impact 41% of the Black population and 54% of the Hispanic population in Minneapolis. In summary, by launching this lawsuit the Minnesota Chamber of Commerce is attempting to take millions of dollars (and by extension, years off of the lives) from low-income communities of color. And they claim they want to leave a legacy for our kids. This begs the question: What kind of legacy does the Minnesota Chamber of Commerce actually want to leave? On February 8th, just four days after the Super Bowl, there will be a hearing on the merits of the lawsuit. While the MN Chamber of Commerce has recently backed out as a direct participant, they still support the substance of the lawsuit. Last week, thousands of workers and community members stood up and fought back during the Super Bowl celebrations, calling on corporations and the government to Divest from violence, Invest in community, and Imagine together what’s possible. We will continue the struggle to Divest, Invest, and Imagine until we win a new world where people come before profits. “White Paper on Income and Health,” Minnesota Department of Health, March 2014. In a recent statement, the Minnesota Chamber of Commerce stated that while they are backing out of the lawsuit, they intend to continue pushing for uniform labor standards at the Legislature and, if necessary, in the courts, “Minnesota Chamber, others pull out of minimum wage lawsuit,” Brandon Stahl, The Star Tribune, December 29, 2018. http://www.startribune.com/minnesota-chamber-others-pull-out-of-minimum-wage-lawsuit/467157953/.